A portrait of Yoda, this is. For those without comedic tastes, an article about Yoda, the so-called experts at Wikipedia have. Read it you must. ~ Yoda to his girlfriend. ~ Yoda on getting old. A deeply wise Jedi master, Yoda is. Often as the "green wrinkly character" from the Star Wars franchise, referred to, he is. 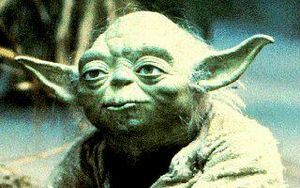 Speak in object-subject-verb word order to confuse his students, Yoda would, for some reason which explained, is not. Manner of such speaking being used in this article, it is. Irritating, is not it? Flawed however, Yoda was. Depleted of strength and tired during the Clone Wars, Yoda was. Hide like a scared little child he did, while the galaxy the Empire conquered. Later, assume the mentoring of Darth Vader's son Luke he would. In the nonexistent year of 896 BBY, born on Yoda's planet, he was. A member of Yoda's species, was he. Yoda's mother and Yoda's father, his parents were. Dictums of wisdom his first words being, "Mama" or "Daddy," as supposed to. If failing grades, Yoda got, A for effort he would not receive. "Do or do not. There is no try," Yoda's parents would say. Encouraging this phrase is not, borderline douchey, it is even. A Jedi master, Yoda eventually became. By now, tired of talking this way, Yoda was. Stop unfortunately, Yoda could not. Sad, the death of Yoda was, indeed yes. Peacefully, Yoda wished to die. Quietly, Yoda wished to die. Unfulfilled were these wishes. While dying Yoda was, ask stupid questions about his father, Luke did. Escape Luke's annoying rambling, Yoda finally did. Earned it he had. Very much one's grandmother like, Yoda is. A professor in physics, Yoda must have been. The Force, master he could. Realize that Force = mass × acceleration, Yoda did. Also moving giant boulders, a talent of Yoda's was. Green, Yoda's lightsaber is. Up to interpretation, is the reason. Perhaps, due to the fact that the opposite of red, green is and red, Darth Vader's saber is. Metaphor, Yoda's saber is, of conflict and contrast between Vader and the Jedi. Perhaps looking too deeply into it, I am. Perhaps, saber green because Yoda is. 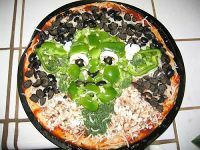 Much like Yoda, this pizza looks. Much known, Yoda is. His appearance on backpacks, speedos, common it is. Look like Yoda, many costumes do. Parody of Lola, Yoda featuring, Weird Al made. On and on, this list will go. Repetitive, becoming it is, however. To you reader you, some Jedi wises secrets here are. All first, grab image mental, pull, then push, make spin, duplicate or/and points through it pull, between thoughts seek space nothing. Later gator force you be, force then birds fly, with fly them. Of last true secret Jedi speak I: Create your reality own you do, past decisions and habits see and break daily some, memories happy time present know, adventures flesh seek you. Run, spot, run. This page was last edited on 27 March 2013, at 15:01.